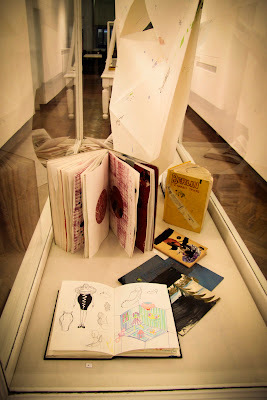 Egidija's Notebook: "Hidden Spaces" sketchbook exhibition: sharing a vitrine with Grayson Perry. "Hidden Spaces" sketchbook exhibition: sharing a vitrine with Grayson Perry. Everybody knows Grayson Perry. Even my daughter (10) knows the potter who looks like Alice (in the Wonderland) and makes vases with penises. OK, she may not be an average ten year old. She does get dragged around galleries a bit. 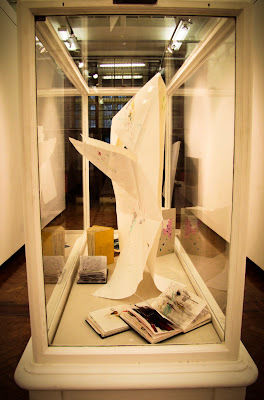 However, it did impress her, that I had to share a vitrine with the Grayson Perry! 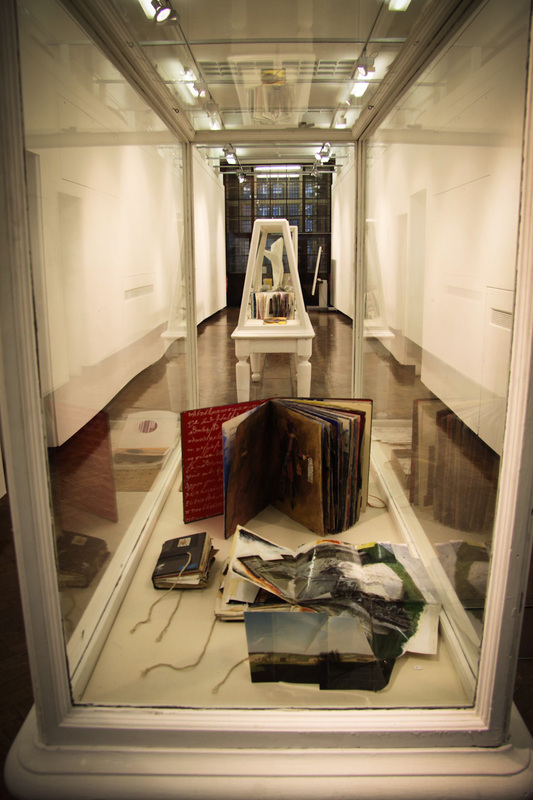 Danny has assembled this really interesting exhibition of sketchbooks, that were shown at Camberwell for a week. I brought in mine just as he was arranging the others, therefore, I had a chance to flick through some amazing - I mean really amazing - and creative sketchbooks. Dannys own sketchbooks are quite remarkable. He uses old books and works on top of them: a kind of pamplicest. 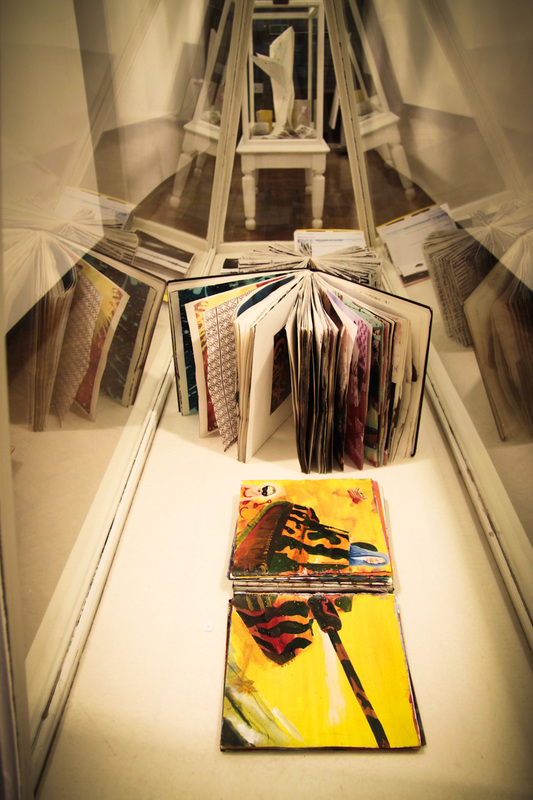 Stephen Cooper's and Janet Bradley's sketchbooks are very "there": bright, bold, full. Natalie Yaxi brought bound volumes of junk mail. Grayson Perry, Christa Harris and me contributed "pocket" sketchbooks, used for casual notes and scribbles. I flicked though Perry's book yesterday. It was full of Jesuses and Marys and churches. A few rabbits on the bikes, a few babies, a few pretty girls. A hint of darkness. A fire. Some writing. It was not much different from his ceramics. However, I am tempted to say, that I enjoyed the sketchbook more, than his vases (and I do love his ceramics!). Is it because it is so much more immediate? More personal? Like looking into the person? Like getting to know the person. 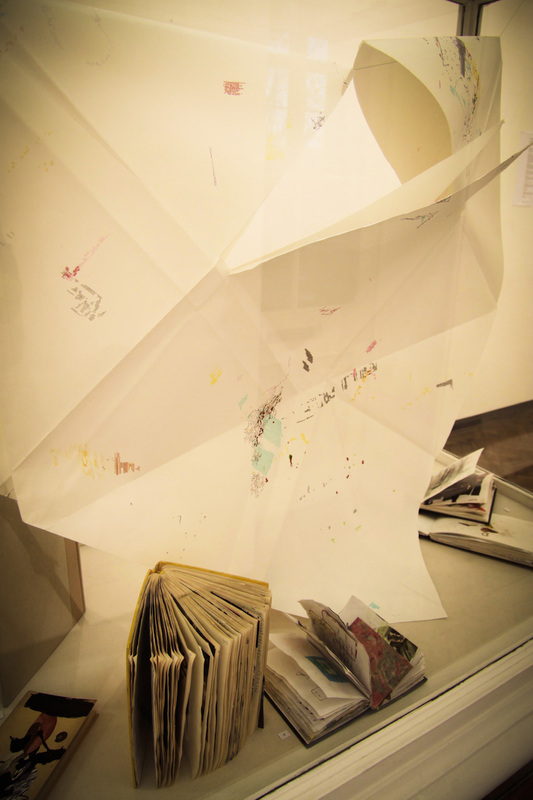 (I suppose aesthetics of the work is the same, but content changes from personal to public). a range of successful practitioners that for the most part have never been exhibited. thinking’, when I am collecting material and making my sketchbooks I can relate to this comment. rooms in a series of books as well as to use them as a basis for a new body of painting installations. elsewhere; all content has been transformed. the past through the existencial traces of the time and space where they were produced. conceptions or boundaries from yourself or others. Its an intellectual space to play with intent. includes film, text, performance and installation. collecting, food packaging, wallpaper scraps, tickets etc.